All transactions are safe and secure with a reliable history in online purchasing behind each of our associates. Buy the Something Nice Thumper t-shirt to own Bambi clothing and merchandise. Available in men's, women's and hoodies. "If you can't say somethin' nice...don't say nothin' at all." Those are the words Thumper's father told him before going out that day, which he so bashfully stated after accidently uttering some unkind words about Bambi's unstable walk and subsequent fall. The two soon made amends and he and his siblings urged Bambi to try to walk again. Soon, the young deer was running about. 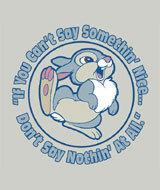 If you think more people should heed this worthwhile message, then grab this Thumper t-shirt for your collection today. In addition to the Something Nice Thumper tee above, browse the Bambi Clothing Gallery for more apparel like men's and women's clothes, kids shirts or hoodies.